A guy I bought a boat from once remarked that the two happiest days for a boater are the day he buys his boat and the day he sells it. We were both pretty happy fellows on that late July day way back in 1993 when that guy sold me his boat. Today I had my second happy boater’s day: I sold the boat. I have very mixed feelings about my transaction today. In fact, the offer to purchase my boat was made in June. It took me all of this time to decide that, yes, it is finally time to part with my little hole in the water, surrounded by fiberglass, into which I have poured a few thousand dollars over the past fifteen years. For a brief time this afternoon, I held in my hand a slip of paper worth just a few hundred dollars that would soon be added to my bank account; but it was all that remained of years and years of family fun outings, solitary sunsets, Saturday afternoon trips down the Grand River to the “Big Lake” (Lake Michigan), Sunday afternoon anchorings with a dozen boats in Petty’s Bayou on Spring Lake, early evening anchorings during the week in the same bayou in the company of only a newspaper and NPR news programming or a little classical music on the radio. On several occasions over the years, we took day trips up the coast from Grand Haven to Muskegon Lake and other trips down the coast to little Pigeon Lake (halfway between Grand Haven and Holland). Then there were those many “drifts” a couple of miles offshore in Lake Michigan where we would cut the engine and place ourselves at the mercy of the wind and the waves for an hour or two while we ate lunch and watched boats run past us in the distance; at other times, we would drift ever so slowly, far offshore, near dusk on a calm, almost glassy Lake Michigan while the sun set slowly, and often quite brilliantly, off to the west. Many years, we enjoyed an annual trip up the entire navigable section of the Grand River to the “gravel pits.” We would have our picnic lunch at Riverside Park near the gravel pits and make a great day of it all. And, of course, I can’t forget Rosy Mound. 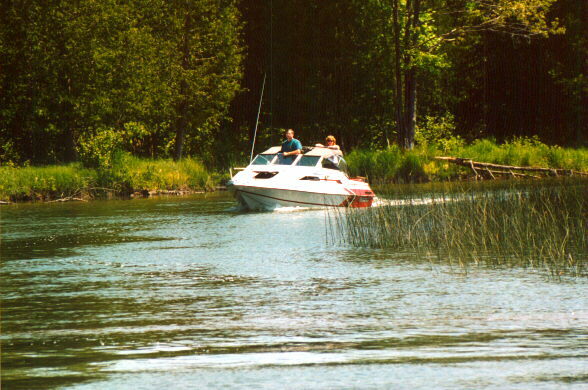 In the early years of our boat ownership, Rosy Mound was by far our favorite destination. We would anchor just a few yards off the beach at the foot of this landmark sand dune south of Grand Haven and swim, play in the sand, sometimes do a little grilling on the beach—and always enjoying the best that life had to offer our young family. Ah—Those were the days! Now the bookmark has been removed, the page has been turned, and it is time to begin a new chapter in leisure-time activities. Whether that new chapter will be about bicycling, trailer camping, road travel, or other activities that we enjoy as pleasant diversions from the the hum-drum of life, two things have been settled for sure today: I am no longer a boat owner; and I am one happy guy!